New demo program that again may be of interest to Pi users. 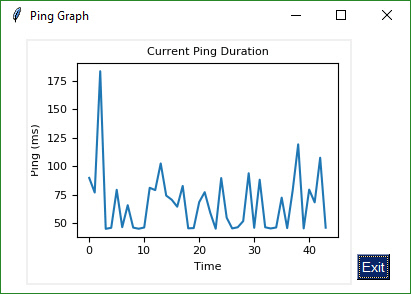 This program plots the time it takes to ping google.com. 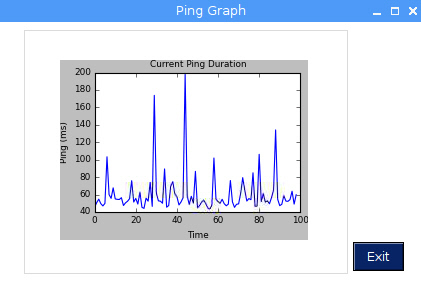 As the filename suggests, it uses Matplotlib. There are no package installs needed to run this demo assuming tkinter and matplotlib are already part of your distribution. The code to ping google is contained within the demo file. It's a pure python implementation. The Windows version looks better than the Pi version because I haven't yet figured out how to set the axis background colors. If you're Pi is sitting idle, this will put something that changes on your screen. It's reasonably efficient with my CPU utilization being between 1 and 15%. Lots of PySimpleGUI changes since the last update here on Aug 31. A Python 2.7 version was released named PySimpleGUI27. The number of demo programs is up to 70 now and lots of new Recipes added to the Cookbook.